This year, more than ever before, I've been doing my best to stick to eating seasonally. The occasional bag of something frozen notwithstanding, I've been good about resisting the cartons of jewel-like grocery store berries tempting us in the dead of winter. I do quite a bit of shopping online, via Fresh Direct, and my first click there is always their "What's Good" button. The feature, which highlights the current peak produce and ranks it by stars, basically guarantees that we're only buying and eating for the correct season. I've even shared this concept with Eugene who has now included the phrase "how many stars was this?" into his vocabulary whenever he reaches for a piece out of the fruit bowl. And even at restaurants, where occasionally the cooks add something that really doesn't belong (invariably raspberries), he'll remark "Ugh...it's just not the season yet," sliding the offending item aside with his fork. The funny thing is that because of this, I've also found myself hesitant to accept that yes, it now REALLY is strawberry season again. It kind of reminds me of the year or so after college when I dropped a bit of that dorm-life weight and yet still kept grabbing dresses off the rack that were much too large for me. It's like my brain is still stuck in the wrong season, waiting for permission to eat lush berries and plums again. Fortunately, their presence at our weekly office farmer's market (conveniently located just outside our office cafe) has jolted me out of that hang-up and for weeks now I've been unable to Stop. Buying. Strawberries. I buy pints of tiny local ones from the market. I buy boxes of them from the street vendor at $2 a quart. And then I add a few more pints to the basket at the grocery store just to be safe. Eugene goes through them as fast as he can (the boy LOVES fruit as dessert; I admit to preferring fruit IN ADDITION TO my dessert), but not even he can work through the stores. So finally, finding myself with several pounds of berries on the verge of death, I took action. 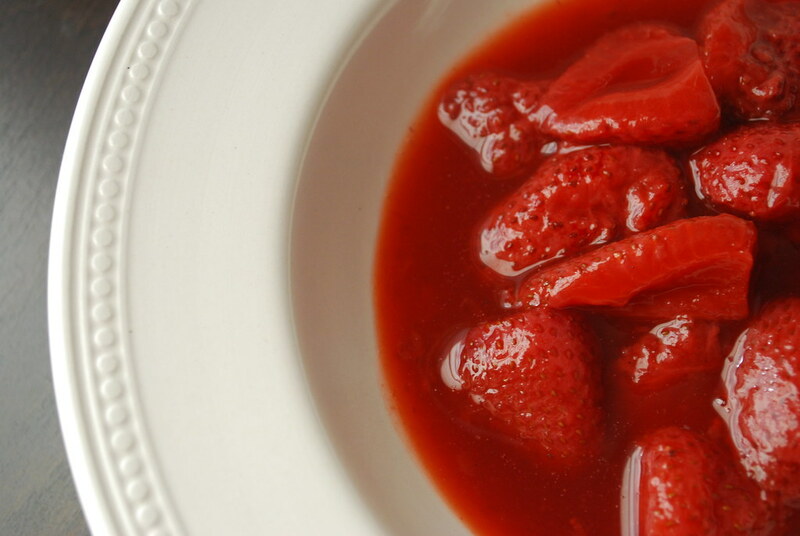 Homemade compote is basically just preserves for the lazy (and improperly air conditioned). Though I love making marmalade and quince paste in the winter, and have daydreams about preserving peaches one day, my current improperly-ventilated kitchen makes the whole task a bit unbearable in the summer months. Fortunately, all this recipe calls for is a bit of a stir and a few drizzles of this and that before it's done. Serve it hot with your oatmeal, or let it chill in the fridge (it lasts for a couple weeks at least). Cold you can pour this over yogurt, serve it with cheesecake or pannacotta, use it in place of syrup on your pancakes, or even enjoy it in a bowl with a drizzle of cream on top. You can even drink it! I've been dropping a few teaspoons at the bottom of my champagne glass--strawberries and champagne; a classic combination! Cook's Note: I used passion fruit juice as the liquid, but you could use pomegranate, orange, even cranberry. Something with a bit of tartness is best to cut the sweetness. Now tell me, have you found yourself making more of an effort lately to eat seasonally? 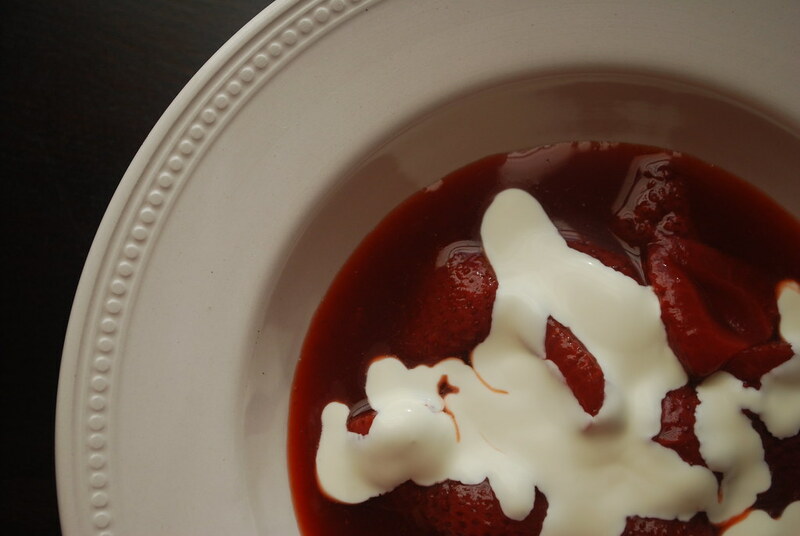 Combine strawberries, sugar, passion fruit puree, and vanilla bean in a large non-reactive saucepan. Set over medium heat and stir until sugar dissolves. Let liquid come up to a boil and reduce heat to medium. Let simmer for about 10 minutes or until the fruit is soft but still retains its shape. Remove from heat and stir in the balsamic vinegar. Let cool completely and then serve or store in an air-tight container in the refrigerator (leave the vanilla bean in). Will last for at least one week, possible more. 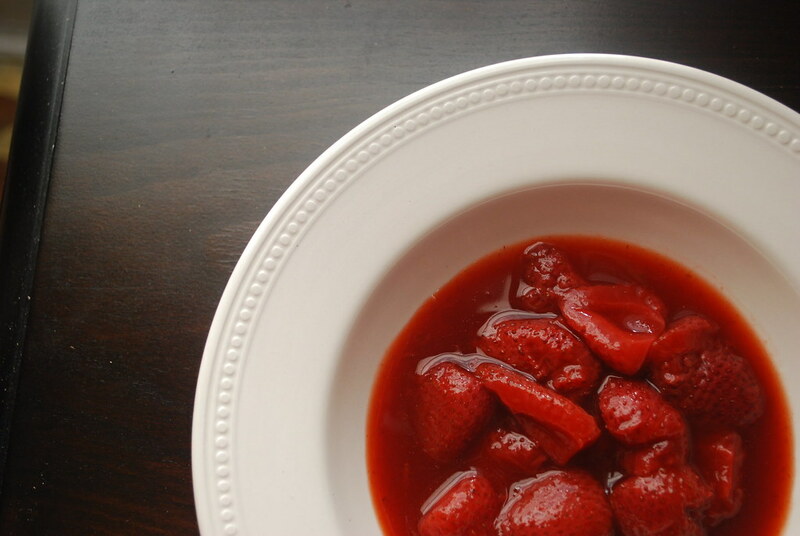 *If desired, you can puree all or part of the berries for a smooth sauce.